To get a feel of how the campaign games play out, I took the mini campaign (3 battles) as presented in issue 9 of Line of Fire (Lock ‘n Load house magazine) for a spin. What follows is a play through summary of my first attempt at the campaign. 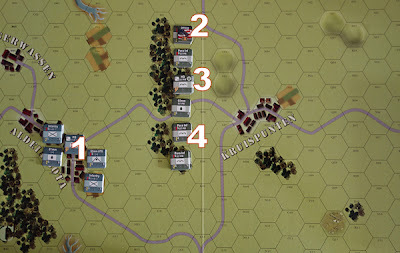 The basic idea is that the American must win scenario 1 to progress to scenario 2 and that the American casualties of the first battle means those units will not be available to the scenario 2 OoB. Providing the American also wins the 2nd scenario, the surviving forces will progress to the third and final battle. Each scenario adds some new troops to the American order of battle and in addition, between battles, that player will get some resource points allocated to them that will allow them to recover some flipped units or buy in some new units. For a full victory, the Americans must hold an objective in the third game AND end the game with the equivalent strength of 3 or more parachute platoons surviving. So regardless of scenario objectives, both players will also need to keep a keen eye on the American parachute platoon strengths. Background - Part of the 101st Airborne Division attempts to rally following the chaos of the night time airborne assault behind Utah Beach. Scenario 1. June 6th 1944 early morning. This is a really nice set-up with a hassle free way of showing the effects of the dispersed para drop. The Germans mainly set up in the town (the objective). One lone reduced platoon is out on patrol. That patrol is always in command and is randomly placed (by die roll). 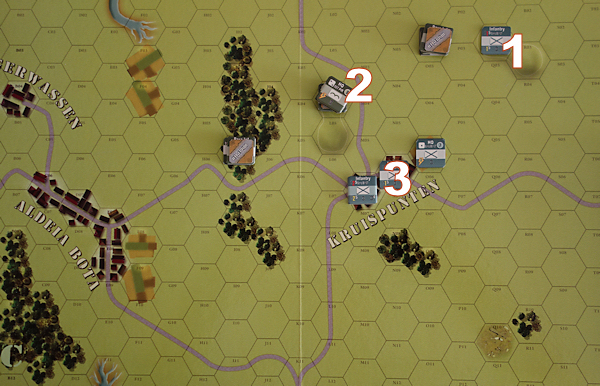 The American Paratroopers land randomly (by die roll) and as they land, they will either be OK, disrupted or both flipped (casualties) and disrupted. Together with night rules reducing visibility, reduced weapon ranges and increasing the defensive value of all terrains by 1 die, this feels like it could be a wild and interesting battle. 2 - The Paratrooper HQ fortunately lands between the other paratroopers, so can give command to them all from the outset. 3 - This is the objective town. On the right is a cultivated area, used by the German Puma platoon. The paratroopers are very lucky with dispersion, they land all in a row with the HQ in the centre, so everything will be in command, but are less lucky with cohesion. They suffer 2 flips and 5 disruptions out of 6 units. They are of course elite units with morale levels of 8, so should rally quite readily. After all that set-up excitement, the actual scenario felt a bit flat and a bit of a walkover for the Americans. There were a few moments of drama such as the counter-attack back into the town by the German Puma platoon and a reduced infantry unit, but overall, it was a short lived scenario. The part that matters being that the Americans won and can go onto the next battle. They earned 8 refit points and lost 1 paratrooper platoon. During the re-fit phase, they flipped two of their remaining platoon back to full strength and banked the remaining 2 refit points. Scenario 2. June 6th 1944 Approaching dawn. This is an 8 turn scenario and night rules still apply to the first 3 turns. The paras must capture and totally occupy the town currently held by the Germans, who now have a 50mm A/T gun and 81mm mortar platoon to assist them. 1 - The German defences and the objective for the American forces. This is another easy attack. By turn 4 the town is in American hands with the gain of 12 refit points. The Americans suffered just two units flipped. During the refit phase, they flip back two paratrooper units to full strength, buy a support weapon (bazooka) and buy in a flipped paratrooper platoon. Scenario 3. June 6th 1944 afternoon. This feels a much more substantial scenario. The Americans will get some new reinforcements (that includes a Sherman platoon) on turn 5 and the Germans have a strong reconnaissance force that includes StuG’s and Pumas plus a Pioneer platoon. This scenario requires two boards but only the centre portion is used, so game charts etc can rest on the outer parts of the board so this is still a compact game (sorry about the photo below, the boards are the same colour, it was dusk and my light was bouncing off the boards in two directions causing that colour shift). 1 - The German formation is forced to set-up here to get across the river. The starting Paratrooper strength is now 6 full strength platoons, 1 half strength platoon plus 2 x HMG, 1 bazooka and 1 60mm mortar unit. a) The Puma recon units can spot concealed units at up to 4 hexes away, so they lose their concealed benefits to them. b) The Germans must capture and hold at least three of the four town hexes to win. c) The Germans only have 3 infantry platoons so run the risk of their unsupported armour getting too close to the paratroopers, especially if they get involved in city fighting (very vulnerable). The German force initially looks quite formidable, but their shortage of infantry against such an infantry heavy defence in a town causes the vehicles to stop 3 hexes away from the town (out of range of infantry assault against the vehicles by the paras) and do some preliminary bombarding with the vehicle guns. Their plan was then to hook around the top of the town and attack from that direction to keep their attack against the town on a narrow front, rather than getting entangled in firefights in the woods and also to put some distance between themselves and the American reinforcing group. 2 - As the Germans stall, paratroopers move into this hex and threaten the German vehicles. 3 - The objective town. the Americans must hold onto 2 of the 4 town hexes to win. But here the German attack immediately ran into trouble. Their opening fire was very poor and not effective at all, so they stayed in position for another few turns to turn up the heat, but that fire was only partially successful. During that time, their own infantry had suffered heavily from return machine gun fire and two paratrooper units had moved out of the town and into the top of the woods and thereby threatened the security of the vehicles. To cap it all, while the Germans were stalled in that position, the American reinforcements came on (albeit a turn late) and the area was suddenly too strongly held for the Germans to do anything else other than to hold their positions and carry on firing. They did manage to destroy the Sherman platoon, but that was hardly going to help the victory point schedule. Then, a poor decision, I got carried away and the two paratrooper units in the woods burst forth in an attempt to close with the vehicles and assault them,. At that moment the dice gods suddenly found favour with the German force and the two platoons were decimated by vehicle fire (supported by their HQ). This would have a critical impact on the final result. 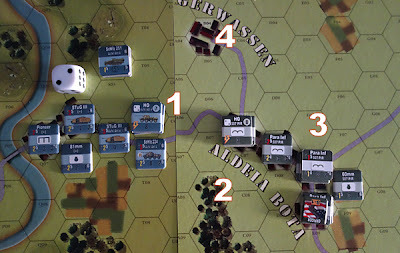 At the end of play the Americans held the town and so won the scenario but with only the equivalent of two paratrooper units remaining, they did not win the campaign itself and the result became a draw. If the two paratrooper units had not charged out of cover to make that last attack, then their survival would have secured an American victory. In this regard, even though the German force had been halted, their continual fire on the town slowly ground down the defending force, contributing to the final result - A DRAW. All in all I enjoyed the campaign game from the story telling perspective. The para landing was fun to set-up, but the first two scenarios then felt a bit thin, but perhaps I need to think of a better deployment for the Germans. I will play it again to see if it might play a bit tighter in the early stages, though obviously it would not be any fun if the campaign kept ending prematurely through American failure. I did wonder whether the refit points awarded were a bit too generous, but a single playing is not enough to answer that question and obviously the playtesters thought not. 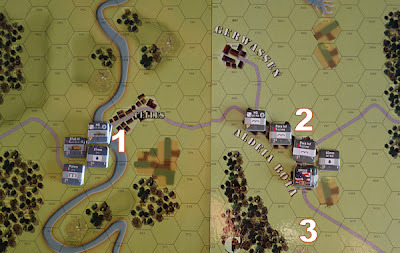 Size - the campaign scenarios use one or two boards and as such the game remains compact. Only the centre part of the two boards are used, so the ‘wings’ can be used to place play aids and dice trays etc. There is a play aid that needs to be on the table and another that can just be kept to one side. Time - I played all three battles in a leisurely 2 hours, including writing notes for this report. Complexity - This campaign is played with just the basic of the system rules. There are a few special scenario rules to deal with things such as night, but it all stays really easy. Solitaire - WSR plays well solitaire and the campaign game is no exception, despite the campaign game being all about the American forces trying to win. Just pull the formation chits and play each side to its best ability. Thank you. I am looking to keep to this kind of 'style' for future write ups, so that there is a blend of game play and system / component description plus some notes on solitaire value, complexity etc. Nice game report Norm. Was this a scenario/campaign from the base game only? One thing about the pics, when I view them the counter info is unreadable and zooming only make them blurry; at least for me with my web browser (chrome). Hi Dave, thanks. I can make the pictures bigger in future. I am trying to keep them below 800 wide because my understanding is that at that size, they do not count towards your graphic file limit. These are 600 wide, so there is scope for more detail. The campaign was published in the Lock 'n Load magazine called Line of Fire (issue 9). It gives 3 new linked scenario's but all components to play are from the WSR base game. That issue also has two other new scenarios and a new map to play them out on, again using the counters from the base game. 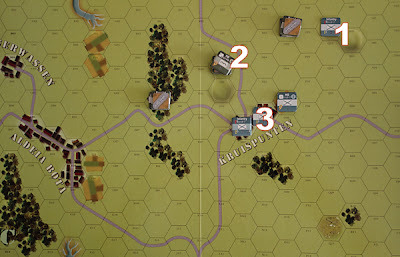 The first is Wittmann's (June 13th) famous tiger engagement scenario and the second is a hypothetical scenario of the day two action that could have followed. I bought the mag as a PDF download.